Workers in the electrical industry are often exposed to hazardous and potentially dangerous workplace conditions while working outdoors in the rain. 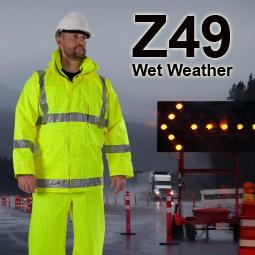 The Z49 FRAS and Z49 wet weather apparel was specifically developed by Elliotts to provide Australia's leading solution for the protection of workers in wet weather conditions. The Elliotts Z49 wet weather gear has been designed to provide the end user with a functional solution to their requirement for a versatile jacket and trouser to protect them from the wind and rain. Z49 Jacket Features Batwing design sleeve construction, Fully seam sealed, Adjustable stowaway hood, Centre front zip closure with Velcro storm flap, Cotton lined, Two large external gusseted chest and waist pockets Adjustable elasticised waist draw cord, Radio loop, Velcro storm cuff closure and AS4836:2011 compliant 3M 8935 FR reflective tape FRAS or 3M reflective tape standard. Z49 Trousers are fully seam sealed, Adjustable elasticised waist draw cord, Velcro storm cuff closure and AS4836:2011 compliant 3M 8935 FR reflective tape FRAS or 3M reflective tape standard. The Z49 Jacket and Trouser is available in a standard wet weather ZETEL® XT construction or as a Flame Retardant Anti-Static ZETEL® ZX construction for extra protection. for road traffic control purposes - High-visibility materials for safety garments. These garments are certified to Australian Standard AS/NZS 4602.1:2011 High Visibility Safety Garments Class D/N by SAI Global. Safety Garments Class D/N by SAI Global.